Every few years, two major tests independently compare the learning of students around the world. According to both tests, American students are far from the head of the class. An ocean away, in fact. Is it time for panic or time for reflection? Or maybe for more denial? Hey, they're just tests, right? Right? Does it really matter that America's students are outscored by those in China, Japan, Korea, Singapore, Canada, Poland, and dozens of other countries? These tests probably matter. Students who score well tend to do well. Countries that do well tend to prosper over time. Find out what these tests mean and how we can learn from the results here. No. The news is even more sobering for the state of California. Each year, a statistically rigorous sample of 4th and 8th graders take tests that help create the “Nation’s Report Card. 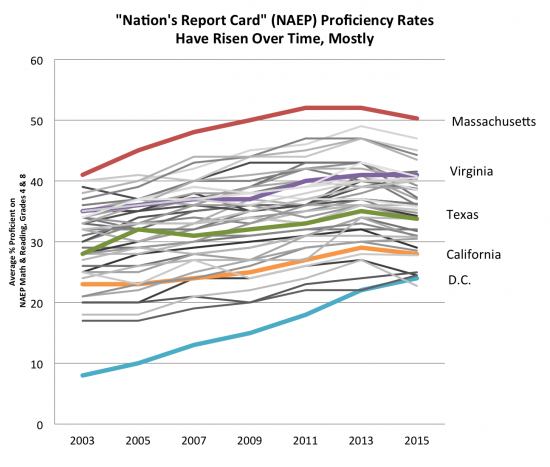 California’s average scores consistently lag national averages. The good news is that scores have risen over time... but that's true everywhere. The bad news is that California isn't investing in its kids, and it's showing. Find out what this means for California here. Rigorous and consistent standards in ALL classrooms. Investing in high quality teachers and school leaders. Additional resources to support at risk students and low performing schools. Early education, after school support, health and counselors. On-going analysis of what works and what needs to be improved--focusing on high need students. Every year, parents have a chance to give input on how to improve schools through the LCAP process in their district. Ed100 has a brand-new checklist to help get you engaged and informed -- and make a difference. Take a peek.